One of America’s most iconic coin designs is the Standing Liberty image created in 1916 by Hermon Atkins MacNeil. Debuting on the American quarter that year, the Standing Liberty image had one of the shortest production runs in American history. The 90% Silver Standing Liberty Quarter is available for purchase today on Silver.com. 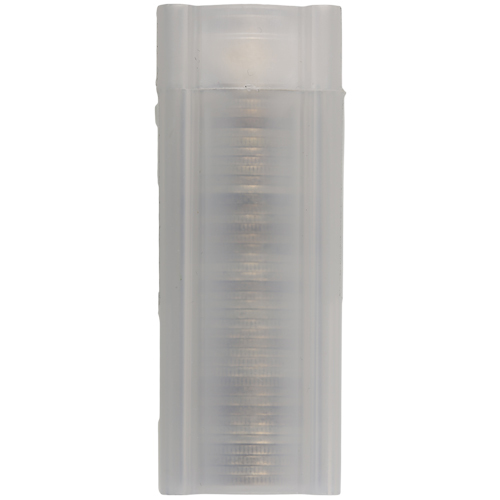 Ships in a plastic coin tube containing 40 US Quarters. Struck from 1916 to 1930. Consists of 7.15 Troy oz per $10 roll. Designed by Hermon Atkins MacNeil. Obverse features the image of Standing Liberty. American bald eagle flies across the reverse. In this Silver.com product listing you have the chance to purchase 90% Silver Standing Liberty Quarters originally produced by the United States Mint. The coins in this listing number 40 in total and ship in coin rolls. Each coin has a date of issue between 1916 and 1930, with .900 silver content. Only pre-1964 US coinage features .900 silver content. The average circulated condition of these coins indicates that they have significant wear and tear as a result of use as a commercial means of exchange. The details and design reliefs of the coin obvious signs of use, though some flaws are the result of mishandling over time as well. Hermon Atkins MacNeil was one of two artists to submit winning designs to the United States Mint in 1916 for use on the nation’s dime, quarter, and half-dollar coins. Adolph A. Weinman’s Mercury/Winged Liberty design won on the dime and his Walking Liberty came out ahead on the half-dollar coin, while MacNeil’s depiction of Liberty won out on the quarter. All three designs replaced the so-called Barber coinage from US Mint Chief Engraver Charles E. Barber, designed in 1892 and in circulation from that date. On the obverse of 90% Silver Standing Liberty Quarters is the image of Lady Liberty standing in the gap for the American people. She is depicted, on most coins, with a chain mail chest plate holding her shield to heraldic east, a design intended to reflect America’s wariness at the onslaught of World War I in Europe. The reverse side of all Standing Liberty Quarters includes MacNeil’s design of the American bald eagle in flight. The eagle is depicted with its wings spread wide as it flies from west to east on the coin’s face. We encourage all Silver.com customers to ask questions of our customer service team. You can reach us on the phone at 888-989-7223, connect with us online through our live chat, or send us an email.